I must admit, I’ve never been a huge fan of wrestling. Even as a child, I found the sport — or, at least, the version presented by the WWE on Saturday morning telly — bizarre, noisy and unbearably silly. That hasn’t changed. I still think it’s weird. But I do recall getting a kick out of Channel 4’s The Wrestlers: Fighting with My Family, a 2012 documentary in which the Bevis family from Norwich, invited us into their home to show us just how much wrestling meant to them. They all wrestled; mum, dad, the kids — everyone. I don’t remember the details, but I’m pretty sure that this fly-on-the-wall series made a point of showing us that it was teenager, Saraya, that would go on to big things. Luckily, writer/director, Stephen Merchant — with a little help from executive producer, Dwayne ‘The Rock’ Johnson — has taken it upon himself to fill in the blanks with this delightful, and enlightening, dramatisation. The fabulous Florence Pugh is Saraya Bevis, the 18-year-old daughter of ‘Rowdy Ricky Knight’ (Nick Frost) and ‘Sweet Saraya’ (Lena Headey), and brother to Zak Zodiac (Jack Lowden). They all wrestle. Dad (a former criminal) runs the World Association of Wrestling in Norwich. When they’re not training local kids, and staging tournaments, they’re on the phone to America, trying to get the kids signed. Eventually, the WWE returns their calls, inviting Saraya and Zak to a try out in London, where wrestling coach, Hutch Morgan (Vince Vaughn), will get a better look at them. The Rock might help, too (Johnson makes a genuinely hilarious cameo). Following trials, Saraya — now calling herself ‘Paige’ — is selected to train with the WWE in Florida. Zak isn’t. You can probably guess what that does to the family. Merchant (The Office, Extras) knows a thing or two about how to charm an audience and in Fighting with My Family, the British film-maker mines both warmth and sincerity out of a real-life story that could have been so easy to poke fun at. 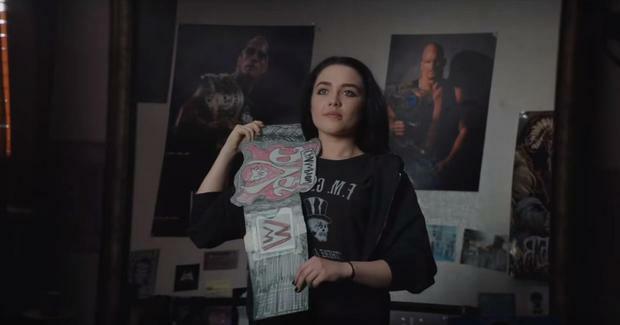 Yes, artistic liberties have been taken, and Paige’s ascent to WWE superstardom wasn’t quite as neat as it’s presented here, but hey, I’m okay with that. Besides, we’ve got a cracking cast to work with. The most valuable player is, of course, Florence Pugh (Lady Macbeth, Outlaw King), a luminous performer whose presence alone is enough to light up an arena, never mind a wrestling ring. She is a star, and this witty, affectionate and charismatic film is the perfect fit.